– getting to the heart of the city from Kaunismaa is as fast as coming from Heathrow airport to Centre of London or Helsinki Airport to the centre. The main highway connecting this serene property is continually being upgraded and will be an easy four lane fast freeway. This will allow one to enter Tallinn at many points, with no bottlenecks. Driving to Kaunismaa is a joy driving through the open country. The land is located in the midst of forests and game tracks, allowing wild deer, fox, and other animals to share the landscape. They are attracted to the freshwater streams and the many ponds that have been placed throughout the development. 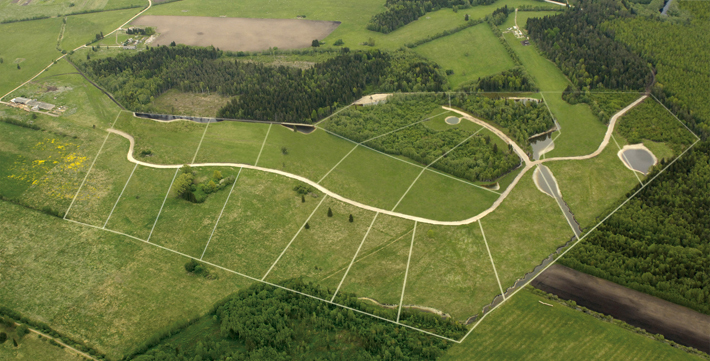 The lots range in size from 20 to 40 thousand square meters and are situated by design to provide privacy. At the same time, a habitat has been created that allows versatile activities and hobbies, such as horses, executive farming or any project that one fancies on their executive estate. A road has been built on the property, and it provides access to all lots that have been designed for privacy and convenience. The development has electricity, which has been brought to each plot along the roads. A unique system of ponds was established by the developer in the spring of 2006. All ponds have flowing water fed from a natural source to replenish and keep the ponds alive and fresh. On some lots, there are also artificial mounds in addition to natural earth berms. This provides more privacy and uniquely turns the lots into something that cannot be praised to the extent it really deserves. These conditions are designed with the aim of creating a harmonious and high-quality environment in the Kaunismaa residential area. It is like a commonly used hideaway for Estonians. 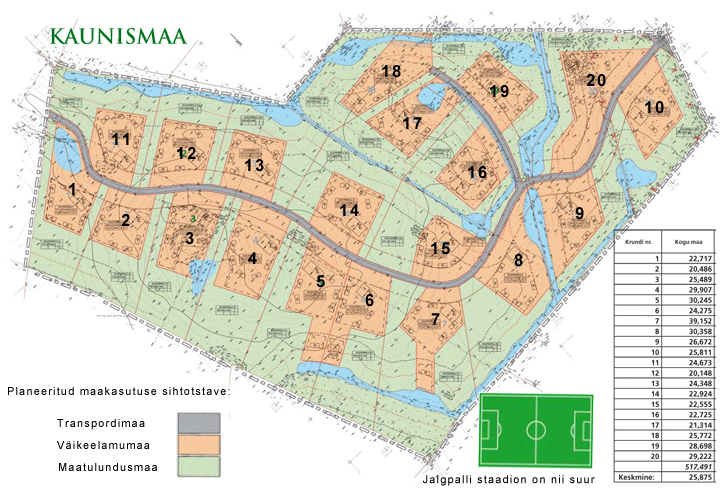 The relatively large plots offer possibilities for leisure and sports. There is a detailed plan for the construction (DET-25045 AB Büroo OÜ), and building conditions. The building design and construction projects are coordinated by architects authorized by the developer of Kaunaismaa (Leonhard Lapin, Toomas Rein, Emil Urbel), who, in justified cases, have the right to authorize derogation from these conditions, with the motive to create a natural and non-intrusive environment for the entire development. The buildings are to be located in a single integrated site on a plot of authorized land. This could be done by creating a comprehensive courtyard or some other architecturally and functionally justified solution. The distance of the buildings within the plot of land is determined by the detailed plan. The location of the buildings will be decided by the architect, coordinating the draft design with the architects authorized by the developer. Entrance to the plot is resolved by the detailed plan. Parking is solved by the original design of the project. Permission has been acquired to drill water wells and install septic tanks to provide drinking water and sewage to the to-be-built houses. It is possible to build houses up to the capacity of 1800 m2 on each of the spacious properties. The shape and nature of the buildings (roofs, etc.) will be decided by the architect of the building, coordinating the solutions with the architects authorized by the developer. The general requirement is high-quality architecture, taking into account the natural nature of the area, such as existing and underlying vegetation, waterways, and landscapes. Building levels and height are determined by the detailed plan. It is recommended to use traditional Estonian and Nordic, natural materials in the landscape of Kaunismaa, taking into account the natural peculiarity and location of a particular plot. Extreme solutions, artificial materials, and bright tones are not recommended. Limitations are based on the same principles and rules that apply to building finishes. Existing landscaping should be maintained as much as possible. For more complex landscaping, it is advisable to use the expertise of a landscaping architect. Extension of aqua projects should be conducted in accordance with the detailed plan. The plots must be well laid out. The guaranteed electrical capacity is 16 A on each plot. Water and sewage matters are solved in accordance with the detailed plans.